Included with today's second estimate GDP report by the Bureau of Economic Analysis is the preliminary estimate for third quarter corporate profits. The corporate profit measure is reported in several different formats, i.e. 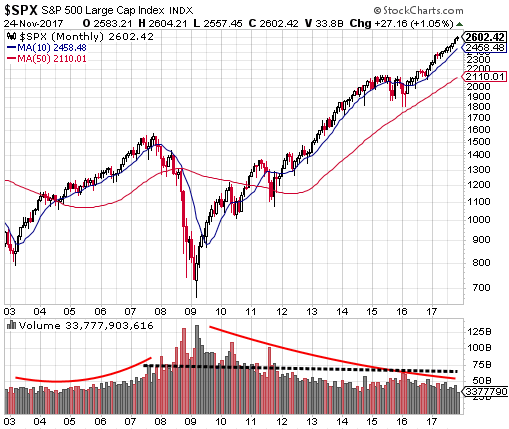 with and without inventory valuation and capital consumption adjustments. As I noted in a June post, more information on the adjustments can be found can be found in this BEA Briefing Paper (PDF). The profit growth before tax and with the inventory valuation and capital consumption adjustments equaled 5.4% on a year over year basis. Without the adjustments, year over year profit growth equaled 10%. 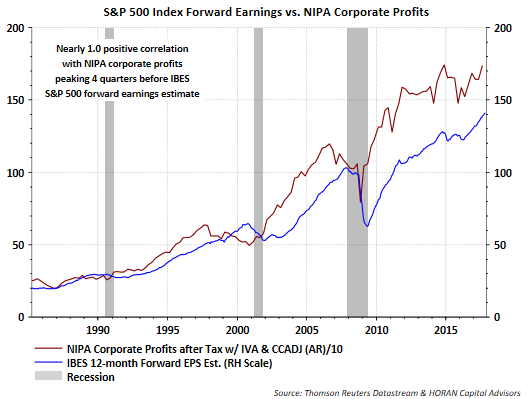 Importantly, NIPA profits have a nearly 1.0 correlation to IBES S&P 500 forward earnings and historically peak four quarters, or a year before the IBES forward earnings estimate. This preliminary corporate profit report is not signalling a peak in IBES S&P 500 forward earnings. Also, with the preliminary corporate profit growth figure one can evaluate the NIPA P/E. 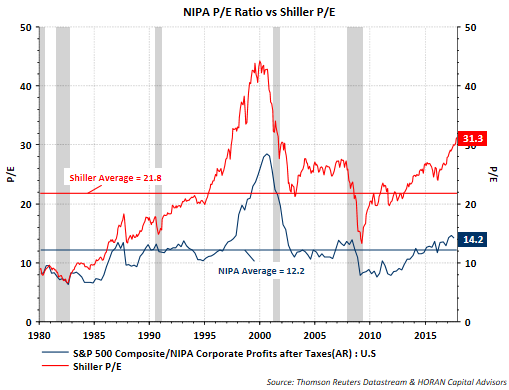 The growth in NIPA corporate profits has resulted in a slight decline in the NIPA P/E as can be seen in the below chart. As I noted in the June post referenced above, what is useful with the NIPA profit measure is the fact it covers a larger earnings base for the U.S and covers more industries as it is not limited to public companies. Additionally, the NIPA figure makes an effort to adjust for the differing accounting measures being utilized by companies. By reviewing some of my posts written over the past few months, the lack of any meaningful market pullback has been one recurring theme. 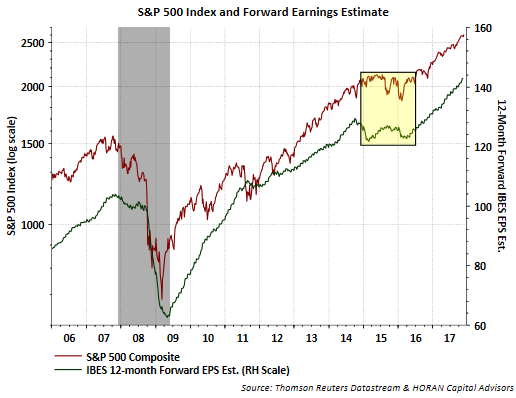 However, with the continued strength exhibited in corporate profit growth, the market's path is certainly warranted as stock prices follow earnings. Also, the strong profit picture is beginning to result in a downtrend in the market's NIPA valuation, without a significant correction taking place. That does not mean high valuation equities will not correct more significantly, like what occurred in some technology stocks today. All in all, today's revision higher in Q3 GDP and the prelimnary profit report are both tailwinds for the economy and equity markets, all else being equal. Consumer confidence soared to a 17-year high in The Conference Board's report today. 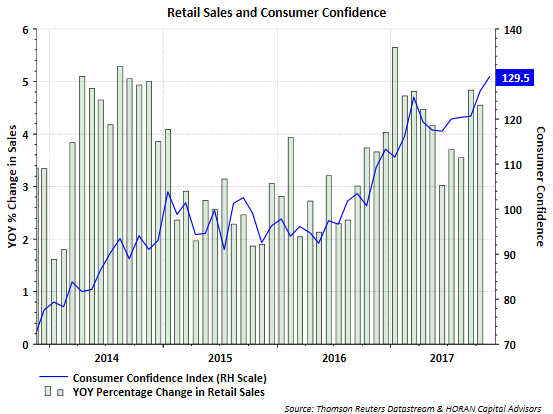 High levels of consumer confidence tend to translate to an improved retail sales environment as can be seen in the below chart. With consumers accounting for approximately 70% of economic (GDP) activity, today's confidence report portends a positive retail sales environment during the holiday shopping season. 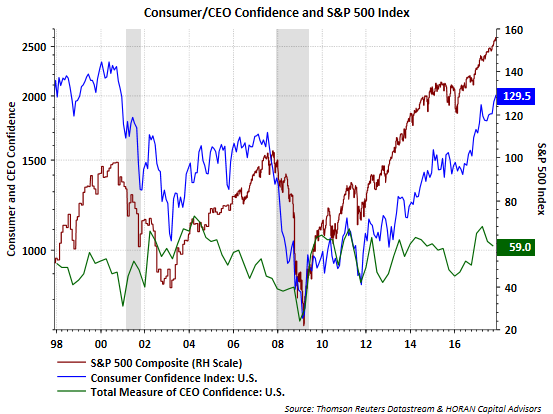 On the other side of the coin though, The Conference Board's third quarter CEO Confidence measure was reported with a slight decline in early October as represented by the green line in the below chart. 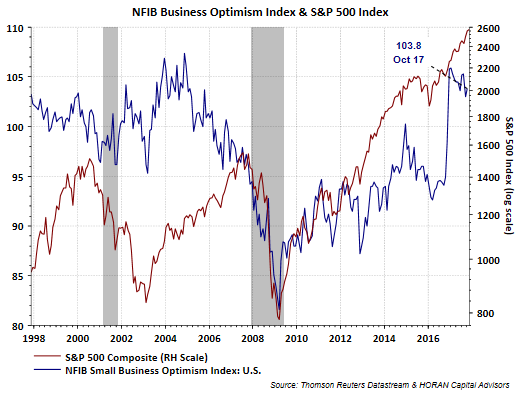 About two weeks ago we reported on the NFIB Small Business Optimism measure and it declined as well in its recent report; however, small business optimism remains at a high level. 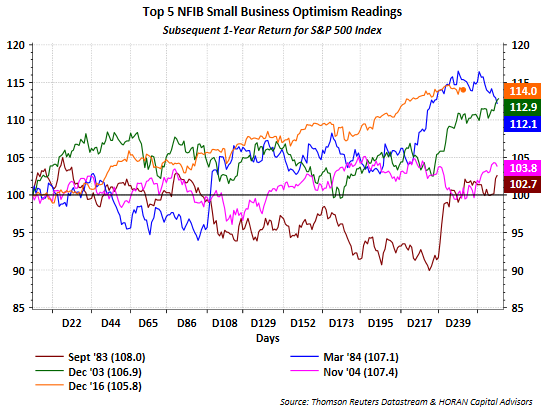 Overall, confidence levels for business and consumers are at relatively high levels and this should be a tailwind for economic activity near term. 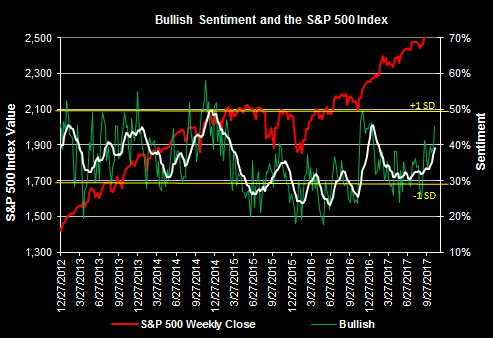 Are Bearish Investor Sentiment Responses Translating Into Actual Action? The S&P 500 Index is only down .60% from its November 8, 2017 high yet individual investor and institutional equity sentiment has turned significantly less positive. 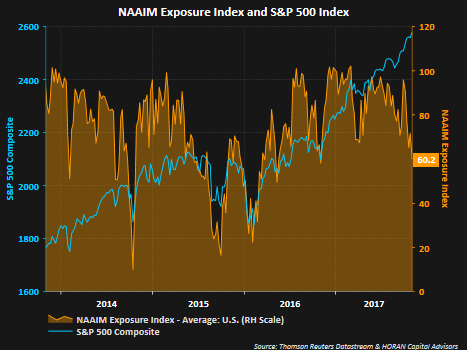 This negative sentiment has not translated into broadly lower equity prices though, but knowing sentiment measures are contrary indicators, they are approaching levels that would be suggestive of higher equity prices ahead. If there is one factor that perplexes me about the current market environment it is the lack of volatility since the election. 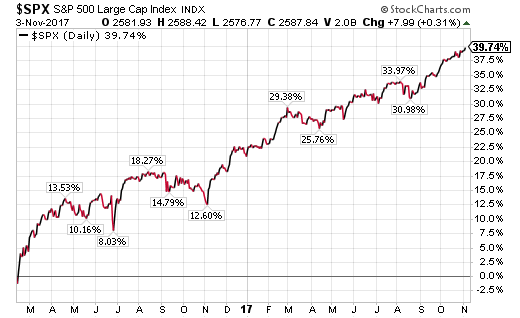 The last time the market experienced a greater than 5% correction was in June of 2016 and the last double digit pullback was in February 2016. 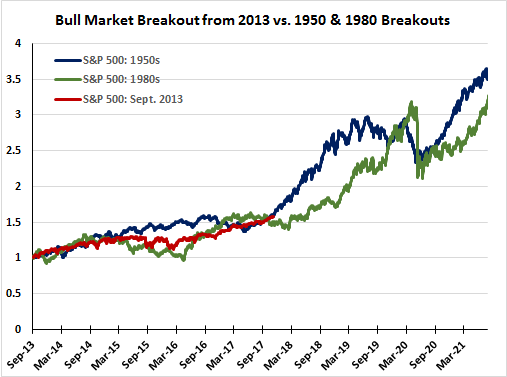 Going back to 1980 the average intra-year market decline for the S&P 500 Index is 14.1%. I have written a number of recent posts on the positive global economic environment, at the risk of sounding like a broken record, that may be serving as a tailwind for equity market returns around the world. On the surface, if one knew mutual funds were holding elevated cash positions, they might conclude that this is a bullish data point since the cash can be deployed in additional equity investments. 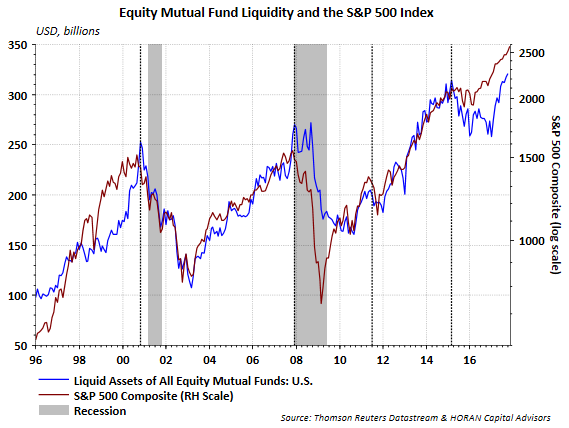 On the other hand, elevated liquidity in equity funds may be a sign of investors rapidly allocating more funds to equities and this might actually be a negative sentiment measure. 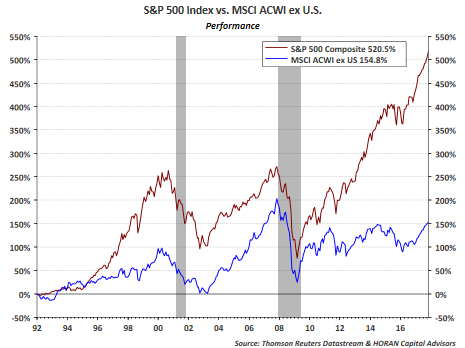 In fact, as the below chart shows, there is a high correlation to elevated liquidity in equity funds and market tops. Every investor makes investment decisions that are influenced by ones biases that form over time. These biases may come in many forms but they tend to fall into a couple of categories, emotional or cognitive. I mention this because it is not that uncommon that I sit down to write a blog post on a certain topic thinking the post's conclusion will go in one direction, but end up with a different conclusion after evaluating some of the research. Some of these blog topics are developed by flipping through a lot of charts, which I do frequently. 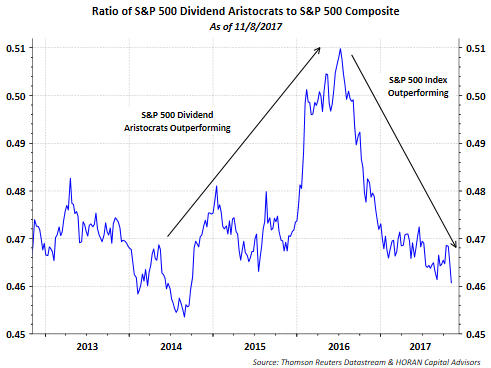 One such chart is below and shows the relative performance of the S&P 500 Dividend Aristocrats to the S&P 500 Index. 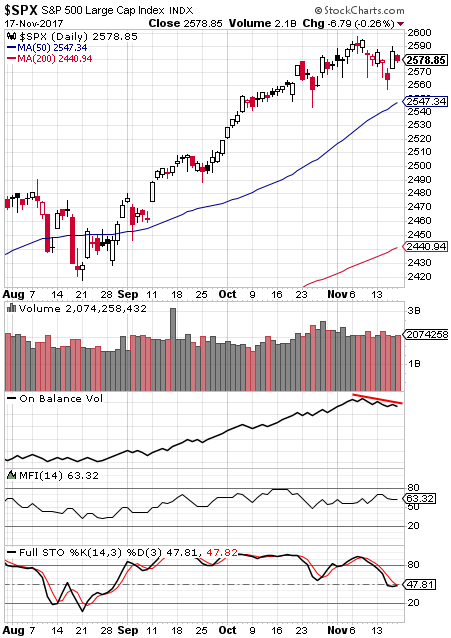 I read an individual's commentary this weekend that was titled Is This As Good As It Gets, and I will have more comments on this later in this post, but it coincides with some clients/investors inquiring whether they should raise cash now. The 'raise cash now' question is certainly understandable when one looks at the strength of the market since the February low last year, up nearly 40% on a price only basis in less than two years.